This is my last post of 2015. HAPPY NEW YEAR LOVELY FRIENDS! Here is a round-up from some of the things I believe are highlights of my year of 2015. January: I had a diving instruction. I’ve always wanted to do one and it was everything I thought it would be. I can’t wait to do it again. February: surprised my boyfriend with a Valentine’s dinner. I nailed my thesis defence. March: Started my second internship and I had a blast. April: I celebrated my birthday. One of my presents was the musical for Snow White. May: We planned a surprise party for my sister’s 21st birthday. June: I ended both internships with fantastic grades, which led to my graduation! I still can’t believe that this part of my life is over. I am now officially engineer Melanie, Bachelor of applied science. July: Three wonderful weeks in Spain together with my loved ones. I bought my DSLR camera. September: Landed my first, yet temporary, job. It was not my dream job, but at least I found something in a short period and I learned some new techniques. I also went to two food truck festivals for the first time, delicious! 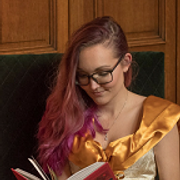 October: I went to my first book event ever (Leigh Bardugo) and it was AMAZING. I had a book club sleep-over with my wonderful friends. November: I went out to dinner with my boyfriend to celebrate our 7th anniversary and I found THE job in my own field! An official Microbiological technician in a hospital, for at least a year. December: I found a (rental) house with my boyfriend! We are finally moving in together. Christmas was wonderful and of course, the start of a new, fresh year. I hosted the (Fairytale) Retelling challenge for the first time. A total of 142 people signed up! I was even approached by a publisher to host a fantastic giveaway for Uprooted. And I’m hosting it for the second time, so make sure to check it out: (Fairytale) Retelling challenge 2016. I participated for the second time in the Love-a-thon, such a fun event. Alexa officially announced the awesome news that: I am now one of the three co-hosts for the 2016 Love-a-thon! I was part of the Dearest blog tour, the blog tour for Shadow study, Queen of Shadows and one for Crimson bound. I was asked for Trick or treat. I decided to do NaNoWriMo and could join the Beautiful Books. 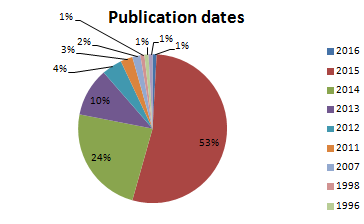 I had a silent third blogoversary in February. I was picked for the #Truthwitch street team (Earth clan!) and it has been such a fun experience. My favorite posts this year. Mel in Movieland – Pinocchio. My movie cast for A court of thorns and roses. This personal post where I talk about my bullying story. My defence for Disney princesses. I’m not someone who is obsessed with followers stats, but I have seen my amount grow through the year and I’m so happy with all of you! Bloglovin’ has 918 followers at this moment. Awesome huh? Twitter: 1,276. I never thought I would be so interesting. Goodreads: 440 followers and 340 friends. Page views in 2015: 41.699. I read a total of 114 books (I think I will be able to finish one more) and 41.306 pages. If you want to see a list of all the books I’ve read this year with ratings, you can click right here: READING LIST 2015. 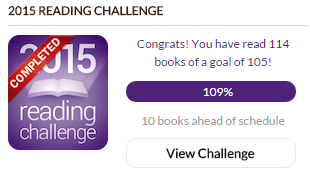 I also managed to complete all my reading challenges! This means I finished: re-read (11), fairytale (37), TBR pile (36), Flights of fantasy (40), Mission impossible: finishing series (10) If you want a list and details, you can click right here: READING CHALLENGES 2015. Is anyone surprised by these results? 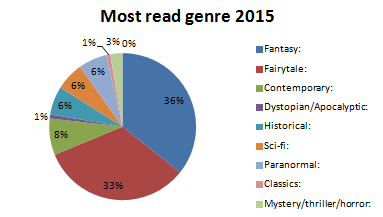 Fantasy and fairytales are always my popular genre. 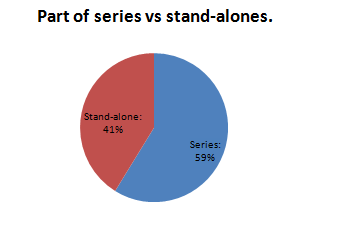 This result surprised me, because I didn't realize I read so many stand-alones! That is not too bad! 1. Samantha Shannon – The mime order. 2. Sarah. J. Maas – A court of thorns and roses. 3. Sharon Biggs Waller – A mad, wicked folly. 4. Leigh Bardugo – Six of crows. 5. Victoria Schwab – A darker shade of magic. 6. Rae Carson – Walk on earth a stranger. 7. Renee Ahdieh – The wrath and the dawn. 8. Naomi Novik – Uprooted. 9. Libba Bray – Lair of dreams. 10. Mindy McGinnis – A madness so discreet. 1. Ishbelle Bee: The singular and extraordinary tale of Mirror and Goth. Confusing. 2. Sarah Prineas - Ash & Bramble. Not my writing-style. 3. Dianne Salerni - The eight day. Lost interest. 4. Hannah Moskowitz - A history of glitter and blood. Nope. Just nope. 5. Jacqueline Garlick - Lumiere. Disconnected from the writing and characters. 6. Stephanie Perkins - Isla. UGH. 7. Colleen Oakes - Wendy Darling. Hate the romance. Don't like the writing. 8. Brian Katcher - The improbable theory of Ana and Zac. Disliked the characters. 9. Ali Novak - The Heartenders. Nooooope. I talked about my blogging and reading resolutions in this blog post. Keep pushing myself. I don’t want to be hold back by fears. Sometimes you simply have to let go and take the plunge. Keep developing and growing. I’ve really started to embrace myself for who I am and that is an amazing feeling. I want to enjoy every single moment and cherish everything I do. I want to spend a lot of time with my friends and loved ones. Awesome things I’ve already planned that I look forward to: Beauty and the beast musical, two spa days, book club sleep-over and Mumford and Sons concert. Go on a vacation with my boyfriend! The first time we will go together. Decorate the house and after we’ve settled down, get a kitten. I’m really thinking about doing a home study/course. I love learning and I'm interested in so many things. Wow! It was a great year! Happy to be on the bandwagon for the fairy tale retellings challenge in 2016. Yayy! You had an awesome year!! Get a kitten? yes yes yes!!!! This should be your #1 priority. Kittens are the best. They are cute, they are fluffy, what more could you ask of them?! hehehe. Anyways I am so glad you had such a great year!! I hope 2016 is just as great! Fantastic year, Mel! It seems like you had a lot of really wonderful things going on and a lot of chances to grow. I'm so thrilled for you to be starting a new job and moving in to a new home with your love! Life is truly beautiful! I hope that 2016 is just as, and even more, wonderful for you! Yes and I'm happy I took every chance to grow :) Thank you <3 I wish all the same for you. Looks like all in all this was a very good year for you, and I'm so happy fo ryou. Wishing 2016 will be even better! Looks like you had a great year & here's to an even better 2016! I'm really excited about the Love-a-thon, also because you're co-host this year. Can't wait till the date's announced so I can start planning for it. I'm so glad you had a mostly great year, and congrats on the house!! I can't afford one in my area so I'm very jealous of anyone who is able to get their own place. And YESSSSS, kittens are awesome! I'm thinking about getting Octavia a friend. Happy New Year, my lovely! MEL YOU DID AMAZING THINGS :( You must've had a great year! 2015 wasn't all that good for me because of the stress and drama I got from school, but I'm hoping that 2016 would be a little bit better, even if I anticipate it to be much harder. I'm glad that you enjoyed your year though, and that you finished most of your challenges! Also, congrats on finding a new rental home with your boyfriend! I wish you happiness and a great 2016 :) Happy new Year!!! I hope 2016 will be better for you :)! Wow, congrats on getting a new home! That's a great way to start the year. I wish you luck with everything, Mel! Sounds like you had a wonderful year. :) I discovered your blog a few months ago and I've really have been enjoying it! I'm also debatin whether or not I should join in the retellings challenge... It does sound like fun! Thank you :D! And you are more than welcome. It sounds like 2015 treated you rather well, Mel! Congrats on graduating and getting your job! That's the best kind of news! It's so nice to be done with school, right? I hope 2016 treats you wonderfully, Mel!! Oh my goodness, Mel it seems like you had an absolutely FANTASTIC 2015!! So, so many congrats on graduating college and landing that stellar new job, and for moving into a new house (it has a ton of bookshelves, right??). I also love how you broke down your stats- that was SO cool to read! 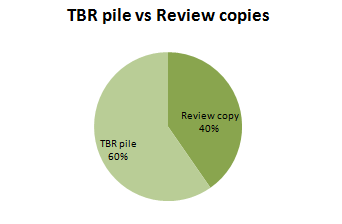 You actually did a really good job reading stand-alone and backlist titles this year- I know my stats with that aren't nearly as nice haha. It seems like 2105 was an amazing year for you! Congrats on getting a house, it's really exciting to move out together with your boyfriend! I remember moving out with mine more than four years ago, it was an amazing experience. Good luck with your personal resolutions, they sound like you're going to take really good care of yourself, which is amazing. Woohoo, go Mel, go!! You've had a fantastic year, and I'm SO stoked for you that you've found a job and house that suits you! I do hope you get a kitten :) Oh, and I loved seeing your pie chart stats! Happy new year Mel! I loved how thorough your recap was, you had such a fantastic year of growth. Congratulations on the new house with your boyfriend! That's so exciting moving in together! Good luck with your goals in 2016, I know you'll do well. Monthly recap December ‘15 | A new house! Let it go | Massive edition. 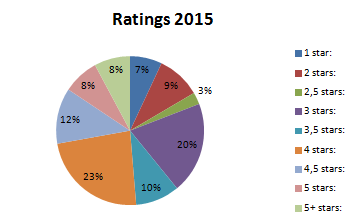 Annual end of the year survey | 2015. Reading and Blogging resolutions 2016. TTT | 20 books from 2015 you should read. December retelling link-up | Bingo-card!